I love coding and all things computery and I want to share it with everyone. Please enjoy my projects. I love Pokemon and Marvel. 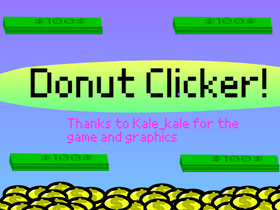 Donut Clicker, my most popular remix EVER!!!! I can also do pixellated Profile Pics for anyone, no matter how famous! Projects I Think Should be Featured! Scratch: Imagine, program!!! All Scratchers invited!